You can work your tail off, live below your means, save like a miser, invest like the experts, build a great retirement nest egg – and still end up with virtually nothing! The hypocrisy of some financial professionals isn’t funny when you are talking about your life savings. I normally get an education about investing in non-correlated assets for protection. “Protection from what?”, I ask. The common answer is, “To protect from a catastrophic loss in your portfolio.” OK, so far…. I then ask about stop losses. I’d urge all readers to ask these questions to your financial advisor. While the answers vary; all too often they tell me not to worry, the market always comes back. They may produce graphs to prove their point, and the market does come back – eventually! I’ll then ask, “If the market suffers a 40% drop or more, can you guarantee it will come back in my lifetime?” No, they can’t! NASDAQ.com tells us that on March 9, 2000 the NASDAQ set a new record – $5,046.86. The next time it set a new record was on May 27, 2015. In real numbers it took 15 years to come back. How much buying power was lost to inflation over that 15-year period? When adjusting for inflation, the buying power of NASDAQ recovered on January 11, 2018. On 3/31/2018 the NASDAQ closed at $7,063.44. While the NASDAQ briefly passed the previous (inflation-adjusted) high, today it has less buying power than 18 years ago. When adjusted for inflation, it took almost 17 years (Dec. 2016), and a wild ride, for the S&P to recover the same buying power. Some believe diversification, coupled with a commitment to buy and hold, is the ultimate protection. How many baby boomers would have the willpower to hang on while their portfolio drops almost 60% between 2000-2009? Can you afford to have your life savings remain stagnant for almost two decades? Stop losses protect against a catastrophic loss resulting from a market crash. Instead of riding the market all the way down, and hoping/praying for it to return, you sell and limit your losses. Baby boomers have a shorter time frame and may not be able to patiently wait for the market to come back. A market crash isn’t the only threat to your life savings. Ask your financial advisor about how you are protected against inflation like we experienced during the Carter years – or perhaps worse. You’ll likely get a variety of responses. Don’t be fooled with Treasury Inflation Protected Securities (TIPS). By design, they do not offer any “portfolio” protection; they only protect the money you have invested in them. The rest of your portfolio is still at risk. Ask about gold and precious metals. Many financial professionals warn me gold is much too risky and pays no interest or dividends. I know of only one financial advisor that strongly recommends gold. Which is it, a great inflation hedge or “a shiny rock with little or no intrinsic value”? In 2008, when the market tanked, interest rates set historic lows. Investors were inundated with pundits predicting inflation spiraling out of control while gold and silver prices skyrocketed. I also felt it was just a matter of time before our currency collapsed. The Fed is continuing to print money hand over fist, yet somehow, the inevitable collapse has not happened. Should gold be looked upon as a stop loss – another form of insurance protecting from a catastrophic loss? Should investors be glad we’ve not seen high inflation, despite holding a percentage of their portfolio in gold? Saving a lot of money to supplement your social security/retirement income is merely a start. Investing wisely and protecting your buying power are major factors in allowing you to retire comfortably. 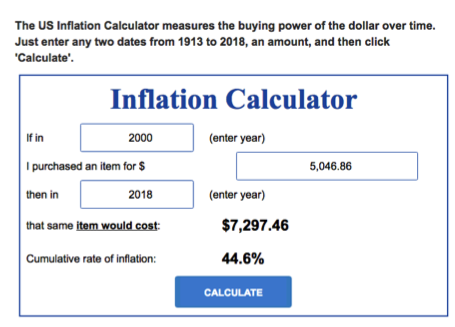 I looked at inflation of several items over the last 50 years; Federal spending, a gallon of gas, a dozen eggs, a gallon of milk, a loaf of bread, an ounce of gold and the S&P 500. The first two columns show what each item cost in 1967 and in 2017. 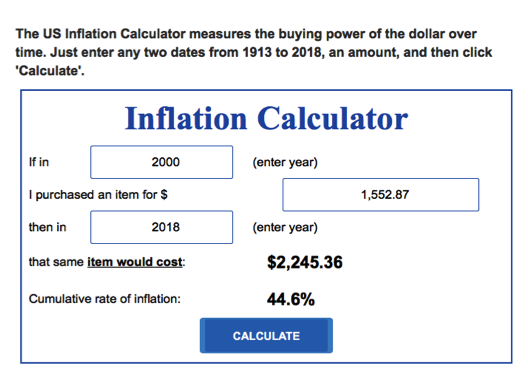 Column 3 (Cost-inflation adjusted) calculates what each item would cost if they rose at the government reported inflation rate. Column 4 is the difference between the actual cost and the inflation-adjusted cost. It was an eye-opener. Federal government spending increased by approximately 146% above the inflation rate. Gas prices followed inflation. Eggs, milk, and bread are actually lower. Gold rose approximately 300% above the rate of inflation. The S&P was up approximately 175% over the 50-year period. I’d be speculating why the inflation-adjusted price of food declined. I was surprised; particularly because of the high cost of federal regulations piled upon American businesses. Perhaps it is through efficiency and market competition. If that’s the case, free market capitalism appears to be alive and well. The “Great Society” was launched by President Johnson in the mid-1960’s. At the time, I said the government was incentivizing out of wedlock birth and the welfare population would rise. Regardless of the cause, government spending has far surpassed the inflation rate and is doing so on borrowed money. The stock market has outpaced inflation. A conservative investor will have a portion in the market for that reason; just keep your stop losses current. 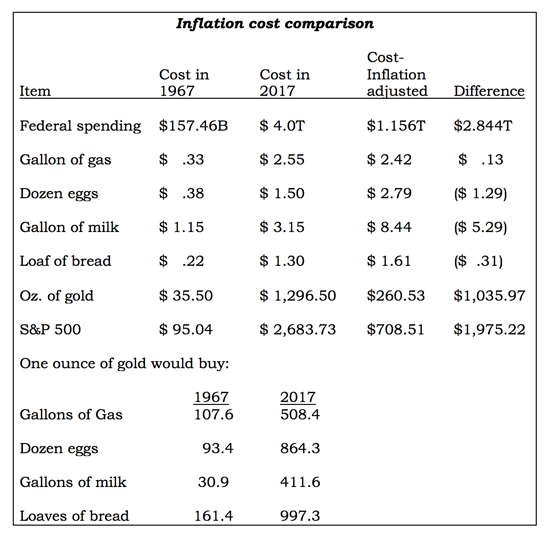 When comparing the buying power of an ounce of gold versus gas, eggs, milk and bread over the last 50 years, gold has performed very well. In the aforementioned article, we looked at the Carter years. Inflation between 1977 & 1982 was 59.9%. The S&P 500 increased from $96.86 to $133.00 (37%) and gold rose from $133.77 to $400.00 (300%). Unfortunately, many diligent savers and investors lost a lot of buying power in a five-year period due to inadequate inflation protection. 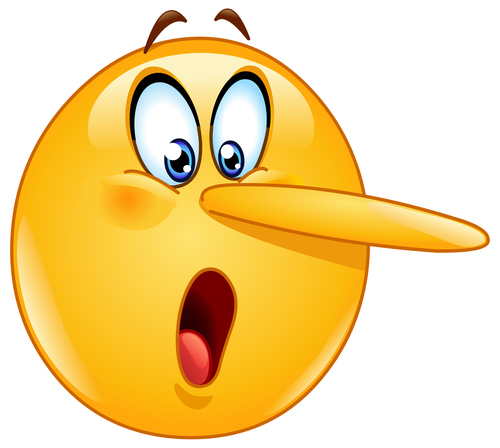 In many cases, the buying power was lost forever! Stocks and gold have historically performed well. I’m sure investment artwork, farmland, and other collectibles also have a history of keeping up with inflation. While no one can predict the future, a well-diversified portfolio should provide adequate income, protect the investor against long and short-term market corrections, and adequately hedge against inflation. Is your portfolio diversified offering realistic protection against catastrophic losses? to its previous inflation-adjusted high in your lifetime? is the buying power of your life saving adequately protected? Vague answers and “trust me” won’t cut it, get the facts and make sure you are totally comfortable! I’ve come to the conclusion that gold serves the same role as a stop loss – helping to insure and protect my life savings from the most catastrophic threat of all – runaway inflation. With government spending and debt exploding as it has, I’m surprised we haven’t already experienced Carter type inflation once again. The Federal Reserve has magically managed to keep the market levitated and inflation reasonable. How much longer can this continue? No one knows; it’s uncharted territory. I hope to never experience the horrible Carter year type of inflation again; however, I’m not selling any of my metals. Inevitably the dollar will lose a great deal of value in a short period of time. If not in my lifetime – our heirs will find their precious metal coins to be quite valuable. Congratulations to the Tampa Bay Lightning for advancing to the Eastern Conference Finals once again. Playoff hockey, particularly when it goes into sudden-death overtime is one of the most exciting sports there is. The game is fast, and Jo and I are generally emotionally exhausted when an exciting game comes to an end. Like most of the country, Phoenix has experienced erratic weather. On May 1st we touched 70 degrees and on the 6th, we went hit 104 degrees. For my birthday last week, we went to Prescott, AZ (5000 feet) for dinner at a neat restaurant, Rosa’s Pizzeria. I’d hoped to sit outside for dessert. It was 40 degrees and damp. We put our tiramisu in a box and drove home. The older you get the tougher it is to lose weight because your body and your fat have become really good friends. Thanks for the helpful article. I believe food prices have declined due to the lowering of its quality. Industrialization of the poultry and dairy industries have created products laden with hormones, antibiotics, as well as the effects from cheap, poor quality feed. Bread (wheat) is compromised by herbicides, pesticides, and genetic modification. In addition, the dough is conditioned by toxic bromine (datem- banned in Europe) as opposed to healthful iodine as it had been until the 1970’s. Not to mention the reduction in the labor force required to produce agricultural and livestock products, not so good for farm workers. These changes have been great for the producer’s bottom line and the consumer’s pocketbook but the costs are passed on in increased medical expenses resulting from malnutrition resulting from lack of nutrients, food allergies and inflammation. Cheap food is generally poor quality food. Anyway, that’s my conclusion. Thanks for taking the time and sharing your opinion for our readers. I had no clue…. Dennis, I enjoyed this article, because this shows the effects of inflation over my entire lifetime (I was born in 1966). However, there was one thing I would quibble with, and that would be the starting price of gold in 1967. Back then, this was the federal government’s fixed price for gold, rather than a free-market price. Gold had that same price since our government created the Bretton Woods agreement, where they decreed that gold would have a value of $35 US for purposes of international trade settlement. If it matters, it was (technically) illegal for private citizens to own gold, so it was off-limits for investment purposes. It was still $35 US when President Gerald Ford signed legislation making it legal for Americans to once again own gold. That was seven years later! This is more of a wrinkle in the timeline than a refutation of the article, because I still agree that everything in the article was valid. Once there was a free market for gold, the price quickly moved to where it should be/is now. It just had a seven-year runway. Thanks for taking the time to write. You make a great point. We can certainly debate the amount of inflation, but would agree the government, by design, has driven the dollar down to the point where prudent investors better take heed.